My apologies for some of the photographs as they were taken some 22 years ago I have tried to tweak them but digital photography was not invented then..............Bro. Charlie Rogerson P.M.
Bro. P. McDonald Bro. M. Paterson Bro. 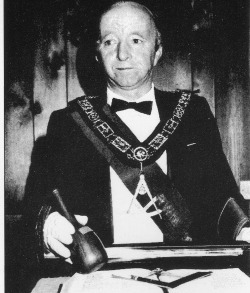 W. McKenzie P.M. Bro. T Speirs Bro K. Robertson Bro W. Allan P.M.
Front Row L to R: Bro.A Donaldson Bro.N. Ritchie P.M. R.W.M. Bro J Bradley Bro.A Wallace Bro.A Millar Bro.J Drysdale Bro.J.Begbie P.M.
D.O.C. Bro. Charlie Rogerson P.M.
R.W.M. Bro. Joe Bradley and Bro Andrew Wallace I.P.M.